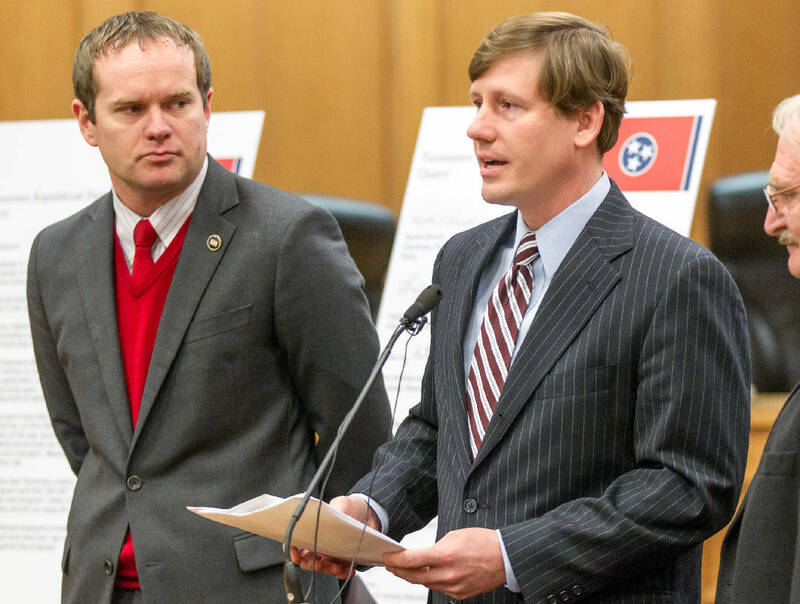 Sen. Brian Kelsey, R-Germantown, speaks at a news conference at the legislative office complex in Nashville, while Rep. Jeremy Durham, R-Franklin, left, listens in this Feb. 2, 2015, photo. POLL: Should Tennessee be forbidden from creating a health insurance exchange? NASHVILLE -- A state senator who played a key role in the death of Republican Gov. Bill Haslam's plan to extend Medicaid to 280,000 low-income Tennesseans now is targeting 230,000 people already covered under the federal health insurance exchange. Sen. Brian Kelsey's bill would block Tennessee from creating its own state-run exchange if opponents to the Affordable Care Act, known as Obamacare, lose their latest legal challenge. But the Germantown Republican faces opposition not only from Haslam and Republican Senate Speaker Ron Ramsey, but from Kelsey's own House sponsor, who said he "[doesn't] really plan to run it as is." The legal challenge is set to come before the U.S. Supreme Court on Wednesday and a decision is expected this summer. It turns on a phrase in the ACA stating that federal subsidies for premiums will be available only to people insured through a state-run exchange. Only 13 states operate their own exchanges. Thirty-seven others, including Tennessee, rely either entirely or largely on the federal marketplace, HealthCare.gov. A successful challenge would bar tax credits or subsidies to enrollees in those 37 states. In an email to the Times Free Press, Kelsey stated, "If Republican Attorneys General win this case, it will be a huge blow to Obamacare and should lead to meaningful, conservative health care reform. That's my hope." But critics say millions of people nationwide could lose their health insurance. Kelsey in 2014 passed a resolution requiring Haslam to get lawmakers' approval to expand the state Medicaid program. Last month, he was among seven Republican senators who voted to kill Haslam's Insure Tennessee Medicaid expansion bill in committee. He recently told Senate Commerce Committee members he strongly hopes the Supreme Court challenge succeeds. But his bill faces serious headwinds starting with Haslam, who has "flagged" it, as have officials with TennCare and the Department of Commerce and Insurance. A flag means the governor or department is opposed. The governor told reporters last week in Memphis his concern is "tying the state's hands in the future to what may or may not be the right proposal." "At the end of the day," Haslam said, "I think good government is about making certain we provide the best alternatives possible." And Kelsey faces a decidedly cool breeze from Ramsey, who noted that the outcome of the Supreme Court case, King vs. Burwell, won't be known for months. Ramsey called Kelsey's bill "more a political statement than it is good government." "I don't think that bill's needed," Ramsey told reporters last week. "Once again, sometimes you have overkill. Just as a general philosophy -- I've talked to [Kelsey] about this -- the basic premise of that is that if the Supreme Court rules this way or if the Supreme Court rules that way ... we're going to do that." "That's not the way you pass legislation," Ramsey added. The speaker also acknowledged that, unlike Haslam's Medicaid plan to cover people who have no insurance at all, banning a state-run exchange could cost tens of thousands of Tennesseans their existing insurance through the federal exchange. "That would be a big problem," Ramsey acknowledged. "It would be something you'd have to take a very serious look at." Meanwhile, the Kelsey bill's primary House sponsor, Rep. Jeremy Durham, R-Franklin, has his own doubts. He was House sponsor of Kelsey's 2014 "Stop Obamacare Act" that required legislative approval to expand Medicaid. The new bill is a place-holder in order to meet bill-filing deadlines, Durham told the Times Free Press. "I think where we're coming from is we want to have a say in whether or not the state has a state-run exchange," Durham said. "Right now, it would just be up to the governor. We did have a disagreement over one of the aspects of Obamacare [Medicaid expansion]." Durham said a more-likely move would be to require the governor get approval from the GOP-controlled General Assembly to create a state exchange. He acknowledged kicking 230,000 presently insured people off the rolls "is more difficult" than denying coverage to people who don't have it now. "We're not going to do anything rash and heavy-handed and just say we're going to outlaw it," Durham said. "But we had to draw the bill a certain way and that's what we started with. I think, again, if we pass something it'll be a legislative sign-off." Regarding an outright ban, Durham said, "I don't think the appetite of the Legislature is there. I don't think the appetite of the House sponsor is there either. You can talk to Brian. But I don't really plan to run it as is." Kelsey also is drawing fire from health care advocates. "Sen. Kelsey gets publicly subsidized insurance himself," said Michele Johnson, executive director of the Tennessee Justice Center. "It is a complete mystery why he is so eager to deny health coverage to his 230,000 fellow Tennesseans who stand to lose their health insurance." Kelsey is one of 116 state lawmakers -- out of 132 in the General Assembly -- who are on the state health plan, which relies on taxpayer funding. Six of the seven senators who voted down Insure Tennessee in the Senate panel had state health insurance. Johnson said a state-operated exchange is what "many middle-class Tennesseans will become insured [through] if the Supreme Court rules against the Affordable Care Act. Tennesseans deserve elected officials who try to solve problems, not create them." Contact staff writer Andy Sher at asher@timesfrepress.com or 615-255-0550.